It’s time to ring in 2017, and with that comes the tradition of the “state of school address.” It’s an opportunity to share key highlights from 2016 and outline our vision for the new year. Our families are an integral part of the success of FMS and we greatly appreciate all your support toward accomplishing our goals. Family commitment was quite evident in February 2016 when 88% of our existing students re-enrolled for the 2016-17 school year, marking our highest retention rate to date. A truly remarkable feat! 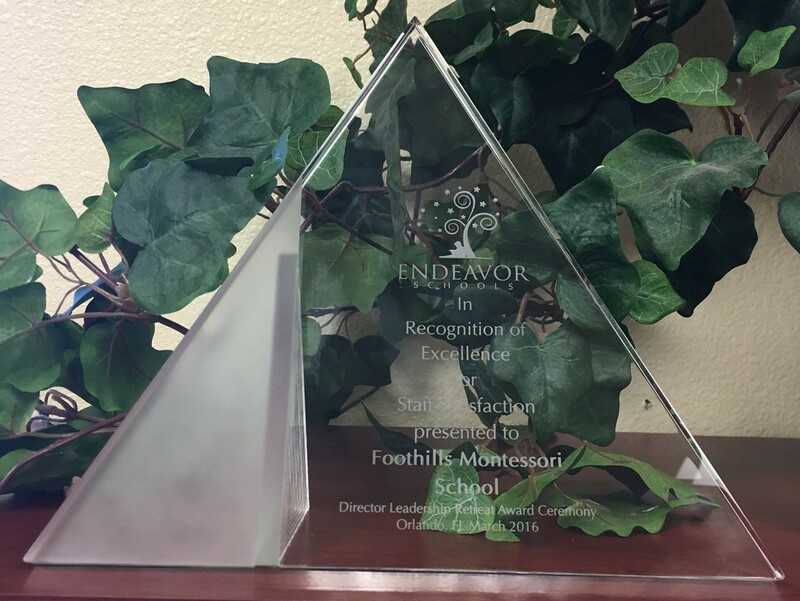 In addition, FMS was awarded recognition of excellence for staff satisfaction by Endeavor Schools. The dedication of our families and students, combined with exceptional educators vested in the mission of FMS, has proven to be the key to our consistent success. In February 2016, I had the opportunity to attend the Director Leadership Retreat hosted by Endeavor Schools in Orlando, FL. One of the workshops addressed the importance of culture, highlighting FMS as a role model. Our parent engagement is impressive, supported by an active PTO to foster the home-school connection thereby creating our unique FMS family. It was a prideful moment to be showcased among educational leaders from around the country. Another workshop addressed effective communication to facilitate parent engagement. Although we have many events that have become annual traditions, a few more were added for the 2016-17 school year. For example, an additional parent child night in the fall at the primary level, family STEM nights for kindergarten through 8th grade, and a high school information night to assist the families of 8th grade students as they transition from FMS to secondary education. Lastly, several of our classrooms are successfully piloting Remind for the current school year which allows parents to receive important reminders via text messaging. Remind will be implemented school wide for the 2017-18 school year. A fundamental goal of the Montessori philosophy is to nourish our students to become life-long learners. Similarly, our educators require fuel to feed their fire. Ms. Erica (E1) and Ms. Melissa (P1), both master teachers and grade level heads, hosted several trainings throughout 2016 tackling topics such as thinking maps, write from the beginning, early childhood writing, developing daily living skills in young children, and incorporating movement and games in early childhood. In addition, four teachers were able to attend the 2016 AMS Conference in Chicago. However, we are incredibly excited the 2017 AMS Conference will be hosted in San Diego which will allow 27 members of our team to attend. The conference consistently delivers dynamic and inspiring workshops for educators and administrators alike, giving us plenty of opportunities to recharge our batteries. Some may believe teachers have an attractive career because they are off campus for the summer. That is simply not the case at FMS! Our veteran team spends countless hours evaluating curriculum and the needs of our students throughout the year, including the summer months. This was especially evident when Ms. Amy, upper elementary head teacher, launched an online reader’s workshop for all 4th – 7th grade students via Edmodo. Children read books from a suggested reading list and then participated in online group discussions to foster critical thinking skills and master comprehension. This endeavor was supported by Ms. Danna and Ms. Erica as they participated as “students” as well. The program was so successful with high student participation that Ms. Danna and Ms. Amy implemented Accelerated Reader (AR) at the upper elementary level in fall 2016. AR offers students and teachers the ability to set individual reading and comprehension goals to keep students engaged, and we are planning to introduce AR to lower elementary in 2017. In addition, Chromebooks were implemented in upper elementary to support AR and MAPs testing. The use of Chromebooks in 4th – 6th grade will also help the students transition to our middle school program, where each student is assigned a device to accommodate Google for Education Apps. Consequently, internet capacity was increased to allow for the ever growing devices on campus and we now have the ability to MAPs test an entire classroom or grade level opposed to small group, resulting in uninterrupted instruction. Middle school Chromebooks will be replaced in January 2017 and upgraded to newer models, and we are also considering replacing upper elementary laptops with Chromebooks for the 2017-18 school year. The FMS campus was built in phases beginning in 2001. Therefore, we have been focusing heavily on campus improvements. During 2016, projects included installation of synthetic turf on the field, painting the office, upgrading the vinyl flooring in middle school, new roofing on all 3 buildings, and the completion of replacing the AC units campus wide with more efficient equipment. In addition, the PTO generously updated the office furnishings to create a warm and welcoming space for our families. Projects under consideration for 2017 include new Montessori shelves in the primary classrooms, installing rubberized surfacing under the Exploratorium, replacing the carpet in the lower elementary and primary classrooms, and painting the exterior of the buildings campus wide. Whew…2016 has been a busy year! Now that you have an understanding of “what” we have accomplished, I’d like to share a story that embodies the “why.” At times, we are presented with “aha” moments just like the children when all our efforts come full circle. One of those moments occurred when Robyn Myers, FMS graduating class of 2013, shared her college admission essay with us (see below). Robyn attributes her current success to the foundation she received at FMS and represents the legacy of our program. We couldn’t be more proud! After spending the first five years of my life surrounded by countless relatives in California, my family decided to pack our lives into cardboard boxes and move to Nevada. Adjusting to this new life may have been impossible without the environment at Foothills Montessori School. This close-knit community created a support system that resembled a family atmosphere. From Kindergarten through eighth grade the student body remained constant, allowing me to learn algebra alongside the students I had learned to write the alphabet with. Until high school I had never heard a school bell, known how to calculate GPA’s, or sat in the typical school desk. I am thankful for this. While at the time I didn’t know it, the purpose of this atypical experience was to make me think sideways. Instead of a bell, teachers orally dismissed students when our lesson was over. This taught me to take my time learning and value depth over breadth. Not having standard grades made me focus on the content, teaching me to learn because I wanted to, not because I had to. Sitting at tables rather than desks led to discussions with other students where we would break down our lessons and examine them from different perspectives. This environment taught me to embrace individual opinions and value collaboration over competition. Montessori taught me to embrace my curious nature and shaped the way I learn and interact with others. It created a foundation for who I am today, and I am beyond grateful. I extend tremendous appreciation to the team of amazing educators who have an impact on our students on a scale that extends far beyond these walls. Your level of dedication and commitment is extraordinary, and I value each and every contribution you make to the success and mission of FMS. Another huge “thank you” to team admin who offers support in countless ways behind the scenes, you are my rock. Most of all, my deepest gratitude to all our families for partnering with FMS for your children’s education. It is truly an honor and a gift to be a part of their journey!